What’s New in Glaucoma Medical Therapy? The long-awaited medical glaucoma revival is finally here, fueled by the development of new medications and emerging drug delivery systems. 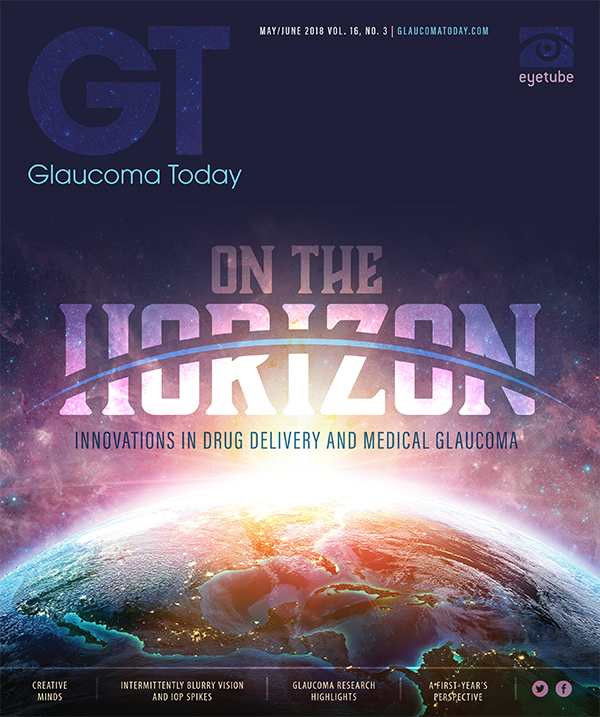 Glaucoma medications have not seen a class innovation since the introduction of prostaglandin analogues (PGAs) in the 1990s. Research and development efforts have bestowed on us new drugs with novel mechanisms of action. Additionally, pharmaceutical companies are devising ways to improve drug delivery systems in order to create more efficacious, simple, and tolerable medications, with the ultimate goal of improving patient adherence. Traditional glaucoma medications fit into several categories, including beta blockers, alpha agonists, carbonic anhydrase inhibitors, parasympathomimetics, and PGAs. These drug categories control IOP through different mechanisms: by (1) increasing aqueous humor outflow via the trabecular meshwork pathway, (2) increasing aqueous humor egress via the uveoscleral outflow pathway, or (3) decreasing production of aqueous humor. Latanoprostene bunod ophthalmic solution 0.024% (Vyzulta, Bausch + Lomb) and netarsudil ophthalmic solution 0.02% (Rhopressa, Aerie Pharmaceuticals) are new antihypertensives that lower IOP via novel mechanisms of action. Figure 1. Vyzulta’s dual mechanism of action. Latanoprost acid increases uveoscleral outflow and butanediol mononitrate increases trabecular outflow via the release of nitric oxide. Glaucoma was a reality for me from the time I was a child, when my maternal grandmother was diagnosed with the disease. Despite bilateral glaucoma surgery and chronic use of pilocarpine drops, her vision was exceedingly poor. I was flattered when she asked me to shop with her, always clutching my hand tightly. What I saw as her being protective was, in reality, a sign she was legally blind, probably with severe optic nerve atrophy, leaving her with limited central vision and a small tunnel field of vision. From my teenage years on, I was determined to be an ophthalmologist. After medical school, residency, and fellowship, I decided to focus on cataracts, glaucoma, and corneal and external diseases. Due to my familial interest and research experience, I joined a private practice in 1987 as the office’s glaucoma specialist. In my first year of practice, I saw about 50 patients with guide dogs. The etiology for their legal or total blindness was often glaucoma. I vowed to do better for future generations. In the late 1980s, pilocarpine drops were the mainstay of glaucoma treatment. The decision-making tradeoff was whether to use a weaker concentration (ie, 1%) with less efficacy and fewer side effects or a stronger concentration (ie, 2% or 4%) with better reduction in IOP but far more symptoms. Hampering our diagnosis was the variability in results from Goldmann visual field (VF) testing, the gold standard diagnostic of that era. Depending on the size of the stimulus used, the skill and methodology of the examiner, and the patient’s endurance and frame of mind during the test, there was a high degree of variability. We instead depended on highly magnified, excellent-quality stereo disc photos and assigned a greater level of importance to changes noted there. When drops were no longer a viable option, the next step was surgical intervention with trabeculectomy. Debates then focused on the optimal size and shape of the trapdoor, the desired size and elevation of the bleb, the benefits versus risks of antimetabolites such as 5-fluorouracil, and the use of devices such as a Simmons shell to help the bleb remain a certain size. A tougher decision, in patients with cataract, was whether to combine trabeculectomy with cataract surgery so that future cataract surgery would not interfere with the bleb. Failed blebs were dreaded. The rare case of endophthalmitis precipitated deep concern and an inclination to be surgically conservative so as to avoid this nightmarish complication. While I was in training, beta blockers had gained an increasingly strong foothold; however, they were not used in private practice because primary care physicians were concerned about double-dosing patients who required a systemic antihypertensive. Eventually, this myth was dispelled, enabling ophthalmologists to prescribe timolol to all patients. Most patients were thrilled—especially those who had lived with the debilitating pilocarpine—thereby increasing patient compliance, enabling better glaucoma control, and significantly reducing the need for argon laser trabeculoplasty. Although stereo disc photos have been reliable for decades, diagnostic testing has taken a quantum leap in the past 2 decades. Automated VF testing machines are now more accurate, reproducible, patient-friendly, and reliable. Devices such as the Humphrey Visual Field Analyzer (Carl Zeiss Meditec) are invaluable for earlier detection of field defects and monitoring response to therapy. Additionally, optic nerve testing with OCT has dramatically enhanced early glaucoma detection as well as monitoring the health of the optic nerve and retinal nerve fiber layer. Over the decades, additional classes of glaucoma eye drops have been introduced, including combination drops containing two medications with different mechanisms of action. The last of the classes to be introduced was the prostaglandin analogues (PGAs), with the first, latanoprost, in 1996. This class of drugs works by decreasing uveoscleral outflow to reduce IOP by 25% to 35%. PGAs had a meteoric rise in popularity because they are effective; are safe with only topical, localized side effects; and require only once-daily dosing. In November, the FDA approved latanoprostene bunod (Vyzulta, Bausch + Lomb), a dual-action eye drop that simultaneously increases trabecular and uveoscleral outflow. As it enters the eye, Vyzulta acts through two metabolites released during its intraocular hydrolysis, which produces latanoprost and butanediol mononitrates. As a dual-action medication, Vyzulta lowers IOP to a greater extent than the PGAs, and the once-daily dosing supports patient compliance. In December, the FDA approved netarsudil mesylate (Rhopressa, Aerie Pharmaceuticals), a once-daily Rho-associated protein kinase (ROCK) inhibitor. Rhopressa works by increasing trabecular outflow through inhibition of the Rho pathway, thereby precipitating cytoskeletal changes to effect the relaxation of cells in the trabecular meshwork and Schlemm canal. Aerie is also expected to release a combination therapy containing netarsudil along with latanoprost (Roclatan), offering another dual-action option. With OCT, automated VF machines, disc photos, and excellent topical glaucoma medications, glaucoma diagnoses and treatment have advanced light-years in my 3 decades of practice. I have gone from having 50 patients with guide dogs in 1987 to one single patient whose blindness is a result of congenital deformities, unrelated to glaucoma. Figure 2. Rhopressa, a ROCK inhibitor, lowers IOP through three mechanisms of action. Attention has also been focused on improving patient adherence. One study found that nearly 45% of glaucoma patients used their once-daily drops less than 75% of the time.10 Improving drug delivery systems may be the solution to this problem. By providing a depot or long-term elution of medication, the burden of daily medication use may be mitigated. Recent drug delivery innovations include Allergan’s bimatoprost sustained-release intracameral implant (Bimatoprost SR; Figure 3) and sustained-release bimatoprost ocular ring, Ocular Therapeutix’s sustained-release travoprost punctal plug (OTX-TP; Figure 4), and Glaukos’ sustained-release travoprost implant (iDose Travoprost; Figure 5). Figure 3. The Bimatoprost SR depot delivery system used to place the biodegradable implant into the anterior chamber of the eye. Figure 4. The OTX-TP insert is placed in the canaliculus and delivers travoprost to the ocular surface for an extended period of time. Figure 5. The iDose Travoprost implant is designed to continuously elute therapeutic levels of travoprost from within the eye. Patient adherence may also be improved by using combination drop therapy. Combigan (timolol/brimonidine 0.2%/0.5%, Allergan), Cosopt (dorzolamide-timolol ophthalmic solution 2%/0.5%, Akorn), and Simbrinza (brinzolamide/brimonidine tartrate ophthalmic suspension, Alcon) are commercially available combination drop therapies with dosing frequency of twice or thrice daily. Compounding companies such as Ocular Science and Imprimis Pharmaceuticals now offer formulations that combine two, three, and four eye drops (timolol and lantanoprost; timolol, brimonidine, and dorzolamide; and timolol, brimonidine, dorzolamide, and latanoprost), reducing the burden and preservative load typically associated with daily use of multiple drops. 1. Dismuke WM, Mbadugha CC, Ellis DZ. NO-induced regulation of human trabecular meshwork cell volume and aqueous humor outflow facility involve the BKCa ion channel. Am J Physiol Cell Physiol. 2008;294:C1378-C1386. 2. Nathanson JA, McKee M. Identification of an extensive system of nitric oxide-producing cells in the ciliary muscle and outflow pathway of the human eye. Invest Ophthalmol Vis Sci. 1995;36(9):1765-1773. 3. Stamer WD, Lei Y, Boussommier-Calleja A, et al. eNOS, a pressure-dependent regulator of intraocular pressure. Invest Ophthalmol Vis Sci. 2011;52(13):9438-9444. 4. Weinreb RN, Sforzolini BS, Vittitow J, Liebmann J. Latanoprostene bunod 0.024% versus timolol maleate 0.5% in subjects with open-angle glaucoma or ocular hypertension: the APOLLO study. Ophthalmology. 2016;123(5):965-973. 5. Medeiros FA, Martin KR, Peace J, Sforzolini BS, Vittitow JL, Weinreb RN. Comparison of latanoprostene bunod 0.024% and timolol maleate 0.5% in open-angle glaucoma or ocular hypertension: the LUNAR study. Am J Ophthalmol. 2016;168:250-259. 6. Wang RF, Williamson JE, Kopczynski C, Serle JB. Effect of 0.04% AR-13324, a ROCK and norepinephrine transporter inhibitor, on aqueous humor dynamics in normotensive monkey eyes. J Glaucoma. 2015;24(1):51-54. 7. Kiel JW, Kopczynski CC. Effect of AR-13324 on episcleral venous pressure in Dutch belted rabbits. J Ocul Pharmacol Ther. 2015;31(3):146-151. 8. Serle JB, Katz LJ, McLaurin E, et al; ROCKET-1 and ROCKET-2 Study Groups. Two phase 3 clinical trials comparing the safety and efficacy of netarsudil to timolol in patients with elevated intraocular pressure: rho kinase elevated IOP treatment trial 1 and 2 (ROCKET-1 and ROCKET-2). Am J Ophthalmol. 2018;186:116-127. 9. FDA Dermatologic and Ophthalmic Drugs Advisory Committee briefing document: NDA 208254. October 13, 2017. http://bit.ly/2J9okPh. Accessed June 1, 2018. 10. Okeke CO, Quigley HA, Jampel HD, et al. Adherence with topical glaucoma medication monitored electronically: the Travatan Dosing Aid study. Ophthalmology. 2009;116(2):191-199.